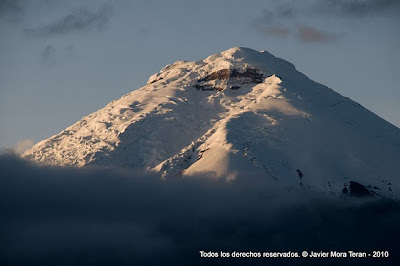 Cotopaxi rises majestically on the eastern highlands of Ecuador. It is the second active highest volcano in the world. Due to its perfect cone shape it has acquired worldwide reputation. The ascent does not present technical difficulties but due to its height it is advisable to be properly acclimatized before climbing it. From the top, the climber will enjoy a superb view of other snow-capped mountains and of the sulfur-emitting crater. One of the highest active volcanoes in the world. Excellent views to other volcanoes. Moderate climb, also suitable for beginners with good physical condition and accompanied by a qualified guide. Accommodation in refuge at 4800m. Estimated climbing hours: 6 - 8h. Ascent, 2 - 4h. Descent. Suggested period: Whole year round except in June and July due to strong winds. Maps for sale in our office.